• Lemon grass contains many essential oils, chemicals, vitamins, and minerals known to have disease preventing and antioxidant properties. • The primary compound found in lemon grass is citral or lemonal, which is not only responsible for giving it its' unique lemon flavor but also the anti-microbial and anti-fungal properties. • The herb contains many essential oils like myrcene, methyl heptenone, dipentene, limonene, citronellol, geraniol, geranyl acetate, and nerol. These oils are known to have insecticidal, antifungal, anti-septic, counter-irritant, and rubefacient properties. • Lemon grass is a very good source of folic acid. Folic acid helps in cell division and DNA synthesis. Folic acid when given during pregnancy prevents neural tube defects in babies. • It contains essential vitamins like pantothenic acid, pyridoxine, and thiamin, required to carry out important body functions. 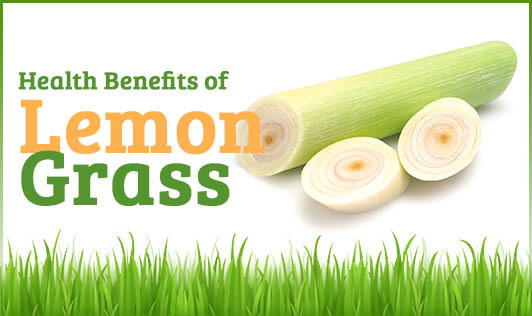 • Lemon grass also contains small amounts of vitamin C, a potent antioxidant. • Lemon grass is a rich source of various minerals like potassium, zinc, calcium, iron, and manganese. It plays an important role in maintaining electrolyte balance in the body, which in turn helps to control heart rate and blood pressure. Minerals like zinc & iron are potent antioxidants, whereas manganese acts as a co-factor for the antioxidant enzyme superoxide dismutase. This amazing herb is easily available in the Indian market and can be used fresh, dried, or as ground herb in a variety of recipes. However make sure to discard the inedible fibrous stems before eating.